Remarkable bowhead whales are the longest-living mammals on earth, reaching over 200 years of age. The only baleen whales to spend their entire lives in Arctic seas, bowhead whales are masters of their icy kingdoms. Kept warm by thick blubber layers over half a meter thick, they have conquered some of the world’s harshest conditions. What do bowheads look like? Bowheads are named after their unique, steeply arched upper jaw and mouth which are shaped like an archer’s bow. Their immense heads have two blowholes and a distinctive V-shaped bow, and measure about a third of their total body length – sometimes reaching up to an incredible 20 meters (65ft) long. 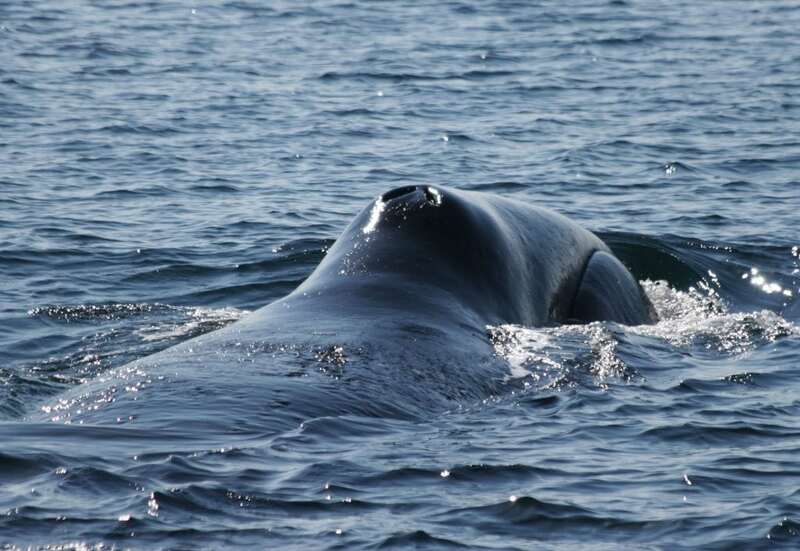 Chunky, rotund whales, bowheads have wide, smooth black backs and paddle-shaped flippers. With a distinctive white chin patch, bowheads also have bellies peppered with white spots and a grey band just in front of their tails. 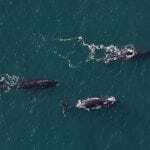 Scientists will often use whales’ dorsal fins to help recognise and keep track of individuals. However, bowhead whales don’t actually have a dorsal fin, or even a ridge or hump. This is because they spend so much of their time swimming around under sea ice, that a dorsal fin would be an awkward inconvenience. So instead, scientists use white scars on their bodies as identifying features. What’s life like for a bowhead whale? Bowheads are not ones to be rushed and don’t really do anything particularly quickly. They grow very slowly, not reaching sexual maturity until they are 25 years old, and females only reproduce every 3 to 4 years. Making sure they stay well-nourished in their Arctic homes, baby bowheads stay with their mothers for about a year, drinking plenty of milk while their baleen develops. Once they have grown up, they tend to travel solo, or in small pods of two or three individuals. Slow growers, bowheads are also slow swimmers and understandably try to conserve their energy. Living in such an extreme environment, they are faced with a number of challenges, including limited visibility and huge layers of ice that build up on the sea’s surface, restricting their access to precious oxygen. Fortunately, bowheads have developed ways of getting around these problems. Using their strong, thick-skulled heads, they can break through sea ice of up to half a metre thick to breathe. They also are hugely vocal, honing an enormous repertoire of sounds that they use to communicate with each other, find food and navigate amongst the icy darkness. Bowheads’ favourite meals are krill and copepods, but they can also eat a range of other small invertebrates and fish. Filter-feeders, they swim along with their mouths partly open, gulping in huge volumes of water and food simultaneously that they then filter through their baleen. Longer than that of any other whale, their baleen can grow up to 4m (13ft) in length. 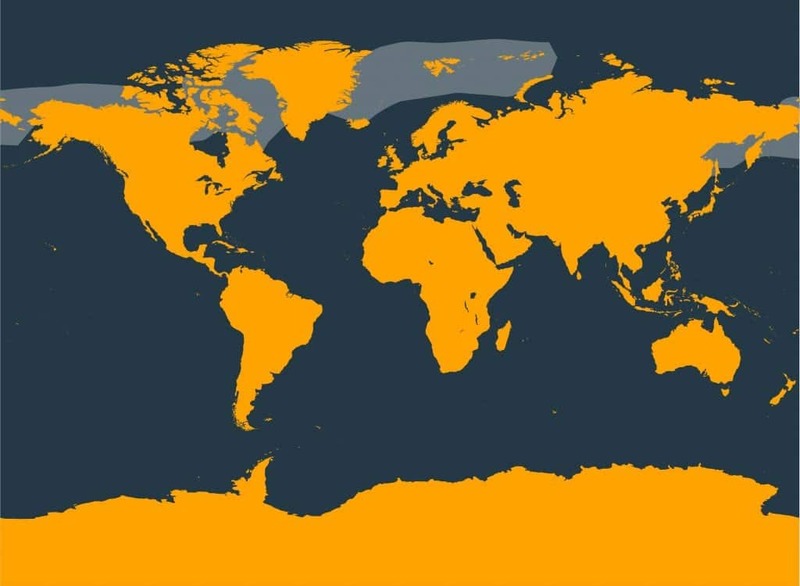 Bowhead whales live only in the polar Arctic waters of the northern hemisphere. They live in mostly shallow coastal water less than 200m deep amongst the sea ice. Bowhead movement patterns in the Arctic are mainly influenced by the seasons and they venture further north during the summer months as the sea ice melts and recedes. Bowhead whales are truly record-breaking goliaths among whales; they have the thickest blubber, thickest skin, longest lifespan, lowest core body temperature, longest baleen, largest mouth, proportionately the largest head and the greatest number of songs of any whale. Scientists think that living in the harsh arctic environment is the reason for the bowhead’s slow growth rate, older age for reproduction, and longer life. We know that bowheads are the longest-living mammal in the world, reaching over 200 years old. But how do we know this? In a sad twist of fate, scientists have been able to age bowheads caught by whalers using the scars and wounds on their bodies from previous whaler attacks. Some bowhead whales caught in recent years have had harpoon heads dating back to the 1800s lodged deep in their blubber, a permanent reminder of man’s devastation of this species. 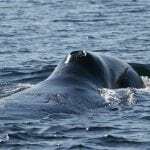 Eskimo hunters have found ancient harpoon heads embedded in the blubber of six bowhead whales they have killed since 1981. Two of the harpoon heads are made of slate, two of other stone, one has a metal blade, and the last one is an ivory harpoon head tipped with metal. These bowheads had clearly survived man’s earlier attempts to kill them and had been swimming around for over 100 years with the harpoon heads in their bodies. This, together with chemical evidence from ‘eye lens ageing’, led scientists to estimate that the oldest male bowhead killed was 211 years old. In truth, we don’t yet know how long bowheads can live. Bowhead whales are musical prodigies and sing all winter long under the Arctic ice. They are creative singers and have a diverse and complex vocal repertoire including calls and songs. The range and variability of their songs is rivalled only by a few species of songbirds. Unlike other whales, bowheads produce lots of different songs each year, and their songs change completely within years and between years. Research is underway to understand the purpose of the singing, but it is likely that the songs play a role in mating behaviour. 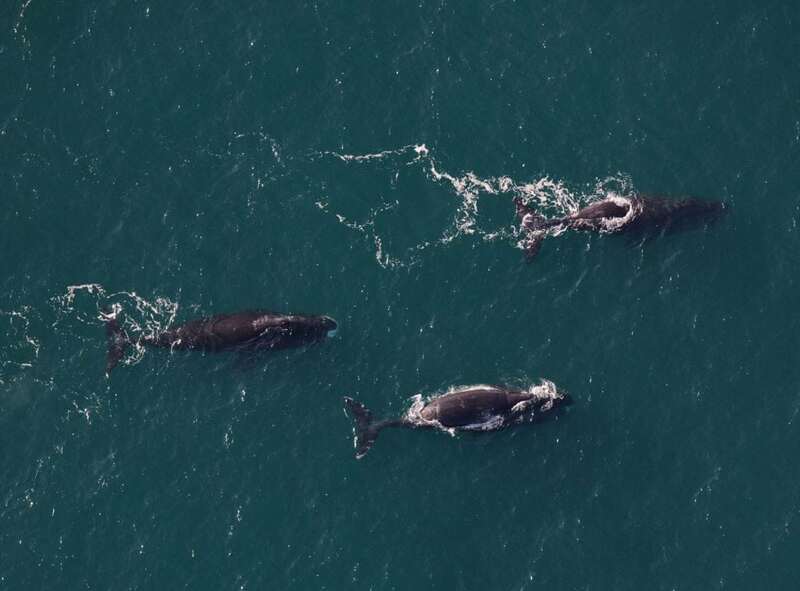 A warming arctic could pose serious challenges for bowhead whales as their habitat undergoes changes and the region becomes more accessible to human activities. 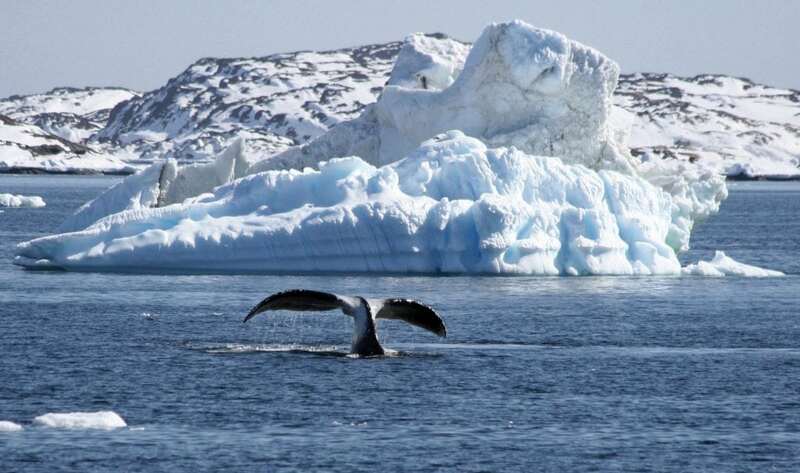 Whaling – aboriginal subsistence hunting is allowed to continue using modern day equipment. 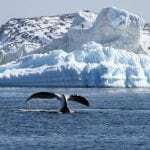 Climate change - as the arctic warms and sea ice melts, it can alter the distribution and availability of food for the whales. Pollution – a warming arctic allows human activities such as exploration for energy sources and increased ship traffic. Fishing gear – ice-free water allows fishing fleets to enter areas that were previously not accessible, increasing the risk of encounters with the whales. By adopting a whale or dolphin, by making a donation, or by fundraising for WDC, you can help us provide a safe future for bowhead whales.